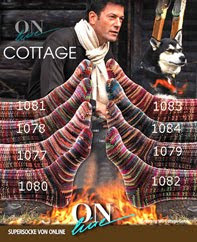 This is a poster for the Online SuperSocke Cottage line of sock yarns. I have No. 1083, which is red to orange to tan. 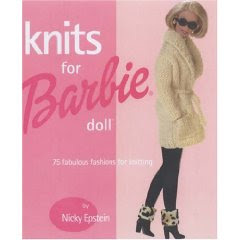 I made a pair of socks for the Hubby, and then used the remainder for a Barbie sweater, from a pattern I found in "Knits for Barbie Doll" by Nicky Epstein. Both of these books are pretty cool - they are not simply duplicate versions of the same patterns, either: each is full of unique clothes I would have loved to have had when I was little. As it stands, my girls are too old for Barbies. Another person might be disappointed at this, but the way I see it, I get to keep the stuff I make. Boo-yah! I like making the birthday cakes for our family, though often there's not enough time to do what I want to in the way of decorating. This year, I made a car cake for our youngest, and it came out pretty good, I think. It was just a yellow cake mix, to which I added chocolate chips, and white pre-made cake icing, to which I added food coloring. I also used black flecks to cover the wheels since I could only manage a brown icing, which I used for the wheels and windshield wipers. I used red LifeSavers for the hub caps and lemon Pez for the license plates. Silver dust used for painting cookies yielded a grey for the headlights and fenders. 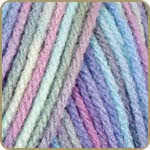 Does it make me a complete yarn nerd that I uploaded the pics I've already collected of yarns I own? And what exactly does it say about me that it's not nearly all the yarn I have? Oh, well: I guess I'm a yarn pirate, and I have quite the stash. Argh, matey, would ya be wantin' to knit and purl? 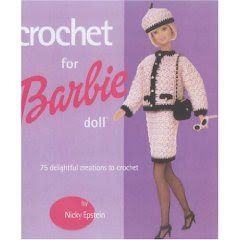 The pattern is a freebie from the Lion Brand site and there's a knitted version, but I used the crocheted version. 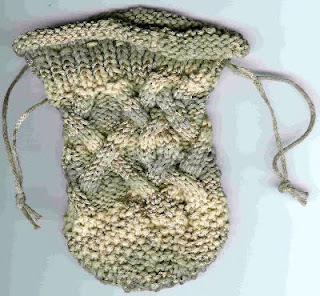 At the time, I didn't own any double-pointed needles and was rather intimidated at the very thought of trying to use them. My crochet gauge, however, is not exactly industry-standard (okay, not even close), so I had to add a number of rows to get the hat wide enough for my liking. 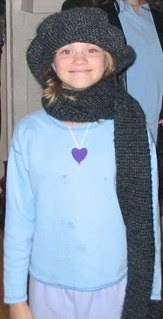 The ends of the scarf are pockets which double as clunky sort of gloves. This set is made from Lion Brand Homespun yarn, which is sometimes hard to work with, but gets wonderfully soft after a few washings. Here are some baby sets I've knitted for co-workers. 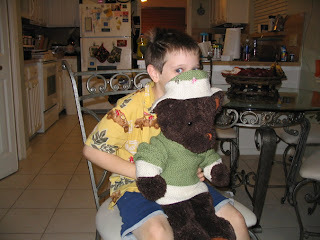 Naturally, since my children are too big for such things, I have them modeled on a teddy bear. Is that so wrong? 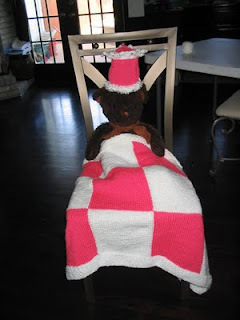 This blankie didn't require a model, so Coco Bear was spared another photo session. 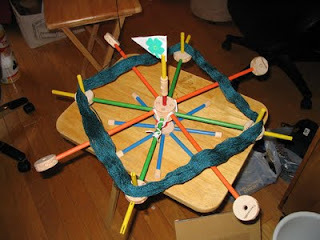 Before I was able to rationalize springing the money for a real yarn swift, I built one from Tinker Toys. For the uninitiated, a yarn swift is a kind of merry-go-round thing you put twists of yarn on so you can wind them into a ball. Note that this particular model was built complete with a little flag bearing a smiling 4-leaf clover. Naturally, the flag has its own little story, though it has nothing to do with the swift. If you must know, I sometimes put my hair up with chopsticks, and my hubby made the flag one day and put it on one of the chopsticks, perhaps so he could locate me more easily in the vast sea of other people running around with chopsticks in their hair. 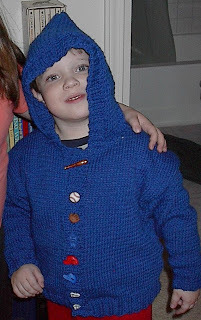 I knitted the blue one for my oldest son for his birthday in 2007; the brown one I gave to a friend. Like dish cloths, dice bags are a great way to practice new techniques while still creating something useful. The brown one is pictured next to the rather large number of dice I was able to cram in it. 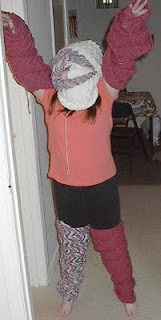 Fortunately, not all knitting gets pre-tested by way of being worn in unintended ways. 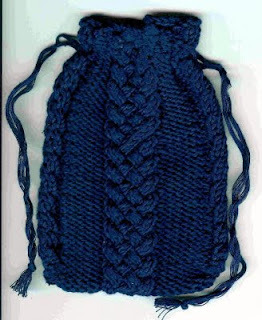 This was knitted in 2004 while its recipient waited patiently. Here's another then-unfinished project that went through the requisite on-body pre-testing. In this case, a multi-colored blanket knitted in strips that I made for the same child that did the pre-testing. No, it's not an ancient Egyptian headdress, just a snake. 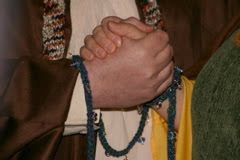 As one might suspect, his somber nature (especially with regard to my knitting) is one of the reasons I married him. Please vote for him so he can make it to their front page and be a famous bunneh-defeatin' kitteh!